I am wrapping up my second interim this week and will probably start another interim later this summer. What a joy to serve among the people of Christ the Servant and I am excited to see how they move forward in ministry with the leadership of their new pastor. Her question plucked a emotional string within me. At one time in my ministry I definitely wanted to have “my own church.” The thought appealed to my ego and my desire to be in charge. However, when I had the opportunity to lead a congregation, I discovered that though I liked the title and some of the challenges in leading a congregation, my heart was restless and troubled. Upon prayerful reflection, I learned that I was “over-identifying” with the congregation and tying my personal worth into the successes and missteps of the congregation. When the congregation felt good, I was good; if the congregation felt down, I was down. When I stepped into interim ministry I was able to detach these emotional strings that I had created. As an interim pastor I have a “lighter” touch on the congregation, relying heavily on the lay leadership to guide the congregation. I am both a consultant who comes from the outside and can observe the current behavior and mission of the congregation while also being a pastor who steps into the community to shepherd them during the interim. As my trainer said, “An interim pastor has one foot in the system and one foot outside the system.” Also my heart is not as restless and my mind is more fully engaged in the community. I believe that this is my calling from God for this stage of my ministry. I am thankful that God has provided a variety of gifts within the church. I am thankful for those pastors, deacons and lay professional who can faithfully serve many years in one congregation, guiding them into deeper levels of vital ministry. I am also thankful for the calling I now have, to guide congregations through the transitions between such settle pastors. The body of Christ needs all the gifts to be healthy and vibrant. How are you using your spiritual gifts? This entry was posted in Spiritual Emotions, Uncategorized, vocation and tagged Christ the Servant, interim ministry, pastor, Spiritual gifts on June 21, 2017 by Pastor John Keller. Recently I posted on my decision to leave as Lead Pastor of Resurrection. Today I am writing about my decision to train for interim ministry. I was introduced to transitions twenty years ago with William Bridges book, Transitions: Making Sense of Life Changes. Bridges describes every transition as having three parts. Each part needs attention. For example, right now I am in the midst of an ending as I prepare to leave Resurrection. Ending always have some element of grief and pain, even when they are chosen endings. Bridges writes “Those who had chosen their transitions tended to minimize the importance of endings, almost as if they felt that to acknowledge that an ending was painful would be to admit that the transition was a mistake.” Leaving a group of people who you love is hard. The second part of a transition is often neglected in our instant society. People and congregations like to rush immediately to the new beginning. “Let’s call a new pastor as soon as possible!” Sometimes a congregation is ready to call a new pastor. Often they are not. Before rushing to the new beginning, individuals and congregations need to pause and assess where they are and what God is doing. Bridges calls this time “The Neutral Zone.” I prefer to call it “The Wilderness Time,” remembering both the wilderness stories of Exodus and Jesus. The Israelites spent forty years between the time they left slavery in Egypt and prior to their new start in the land of Canaan. They wandered in the wilderness. 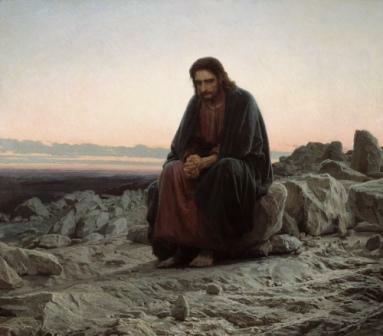 Jesus spent forty days in the wilderness after his baptism. His was a time of intense prayer as to what his ministry would be. Intentional Interim Ministry is for the wilderness time in a congregation’s life. When a long-tenured pastor leaves, an interim pastor is hired to serve a short contract (6-18 months) to shepherd the congregation through a time of assessment as it prepares to call a new pastor. These “temporary shepherds” may need to deal with certain issues (past conflict, neglect, staff concerns to name just a few) as well as help the leadership prepare for their next pastor. I sense a call to this kind of intense but short-duration ministry. My own prayer life is centered on the phrase, “Be still and know that I am God” Psalm 46:10. 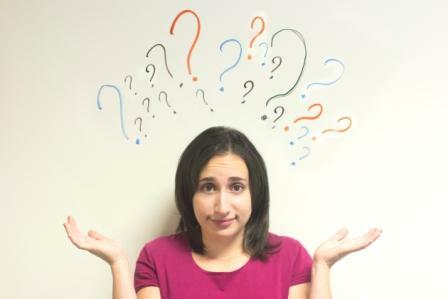 During an interim a congregation needs to be still and discover whose they are. I believe I have the wisdom, experience, patience and pastoral skills to assist congregations during their transition. Time will tell. I will start the specialized training for Intentional Interim Ministry on Monday, October 26. Prayers appreciated. This entry was posted in Beginnings, ending, Jesus, Resurrection Lutheran Church, Uncategorized, vocation and tagged interim ministry, transition on October 6, 2015 by Pastor John Keller. Martin was a cobbler, a man who made shoes. Most of us take shoes for granted, especially if they are work shoes or everyday shoes, the kind Martin made. Oh he could make your fancy dress shoes, your party shoes, your “lets-get-everyone-to-notice-me” shoes but he preferred to make simple, dependable shoes. Now don’t get me wrong, his shoes were not ugly. In fact they were quite beautiful in a simple, unadorned way. And they were popular. Martin had plenty of people coming to his shop everyday to buy his shoes and he enjoyed his work. 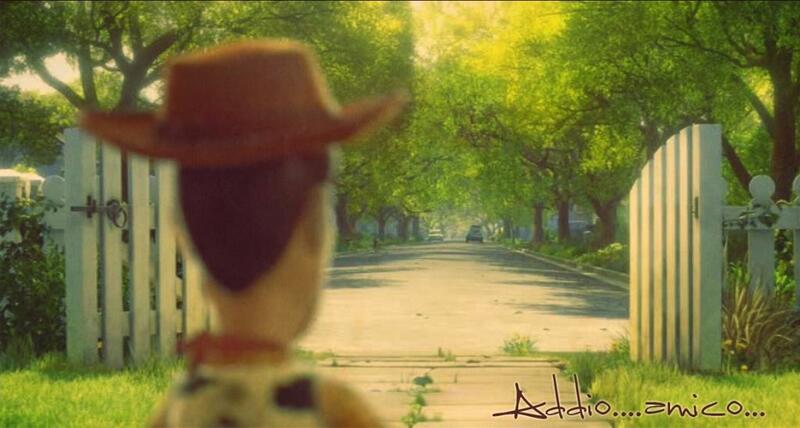 In the evening he would walk home and he would get a kick spotting his shoes on the people he passed. “There is a pair,” he would say to himself “there is another.” He felt a certain satisfaction that his work kept people happy. On Sunday, Martin would go to church with his family, as was his custom. He sang, he prayed, he talked with fellow members. Occasionally he would spot a pair of his shoes. Martin was grateful to God for this community of faith. He found strength and comfort in being with other Christians. One Sunday, while in church, as he listened to the sermon, he felt a sudden inspiration. He had always wanted a way to express his faith in Jesus in a more tangible, direct way. Words were always awkward for him. He knew he was no preacher. Still he wanted to do something for God. The next day he got to work. He tried different styles and materials for the cross. He tried copper and iron, wood and leather. He tried big crosses and little crosses. He put them on the front of the shoe and the back of the shoe. He wanted the cross to be perfect because he wanted to express his love of Jesus in that cross. As he added the cross to his shoes, he expected his customers to comment or ask questions about the shoe cross. Only a few did. Most customers asked about fit, comfort and durability, questions they always asked when they bought shoes. Still Martin would not be deterred. He continued to invest time and thought into the crosses he made. He wanted to make a good impression. But he was particularly struck that many of his fellow church member were not wearing his shoes. Were they offended by the cross? This gnawed at him for several weeks, until finally after church one Sunday, he asked one of his former customers , Pete. And then it dawned on Martin. He had become so focused on making crosses for his shoes that he had cut corners on the shoes themselves. He checked this out with other former customers and they concurred with Pete. Martin’s shoes were not as good as before. 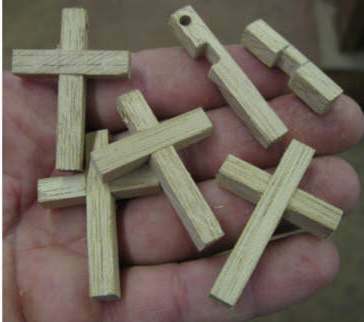 The next day Martin took all the elaborate crosses he had made and put them in a bottom drawer. He refocused himself on making simple, comfortable, durable shoes. And inside each pair, hidden from view, he sewed a simple leather cross, to remind himself that as he served his customers he was serving Jesus. This entry was posted in story, Uncategorized, vocation and tagged cross on March 21, 2014 by Pastor John Keller. When I was called to Resurrection Lutheran Church two and a half years ago, the call committee had a key question for me, “how will you handle the present staff?” They were concerned that as the new lead pastor I might want to make immediate radical changes to the staff. I told the call committee that I wanted first to discover the staff’s unique gifts and contributions to the congregation before any changes. I quickly discovered that the staff was and is talented and dedicated. They each had something to contribute. Perhaps the most notable was the only other full-time employee, Sarah Storvick. Sarah started working at Resurrection part-time as the Director of Children’s Ministry in April, 1998, overseeing the Sunday School ministry. She brought great creativity and compassion to her work. 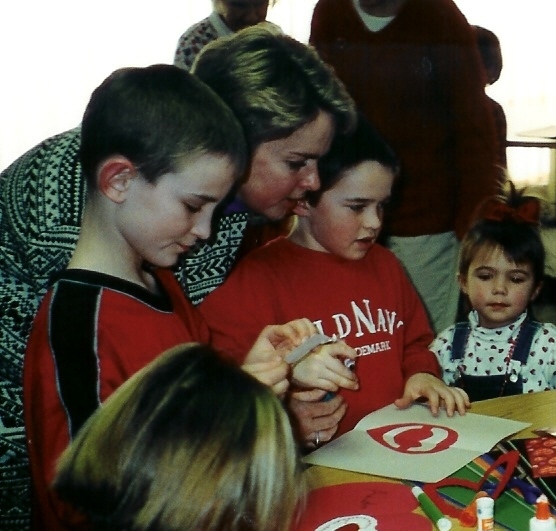 She cared about each of the children who attended, calling them by name and encouraging their growth in grace. 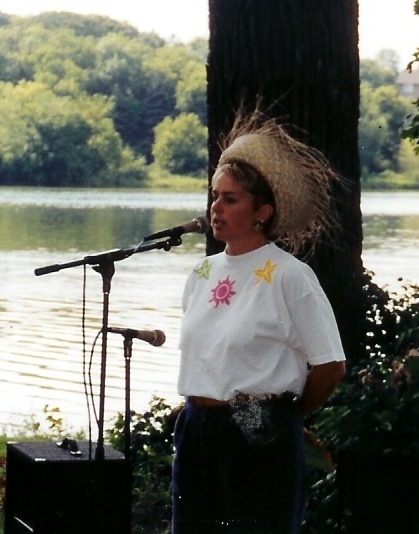 She coordinated Vacation Bible Adventure, First Communion instruction and Camp Wapogasset participation. Over the years her responsibilities grew and she has expanded into confirmation and adult ministries. She not only embraced the mission of calling all people to a Vibrant Life of Faith in Christ, but exemplified what the Vibrant Life looks like. 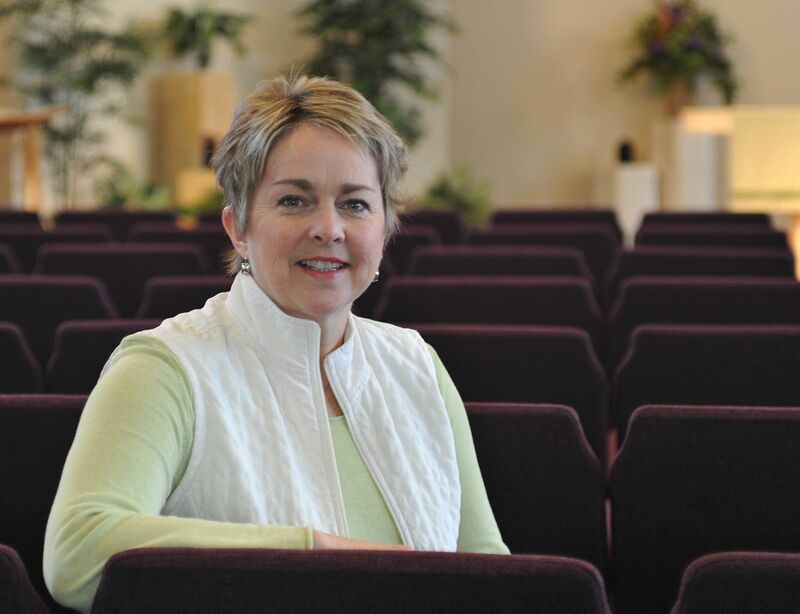 She became a full-time employee in 2010 and was most recently commissioned as the Minister of Congregational Life. The executives who ignited transformations from good to great did not first figure out where to drive the bus and then get people to take it there. No, they first got the right people on the bus (and the wrong people off the bus) and then figured out where to drive it (Good to Great, p. 41). The first thing the apostles did after Jesus ascended into heaven was to select who would take Judas’ place as one of the twelve apostles (Acts 1:12-26). They needed to determine who was on the bus of Jesus’ continued mission. I am so thankful to have Sarah on the bus of Resurrection. Her steadfast commitment, her dry sense of humor, her compassion and vibrant faith all contribute so much to the ongoing mission of Resurrection. She has even gracious written for my blog when I was away. Tomorrow (Sunday, April 21) Resurrection will celebrate Sarah’s ministry during our Sunday morning worship. Thank you, Sarah, for faithfully serving our Lord Jesus among the people of Resurrection. We are blessed to have you in our midst. Lord Jesus, thank you for the ministry of Sarah Storvick. 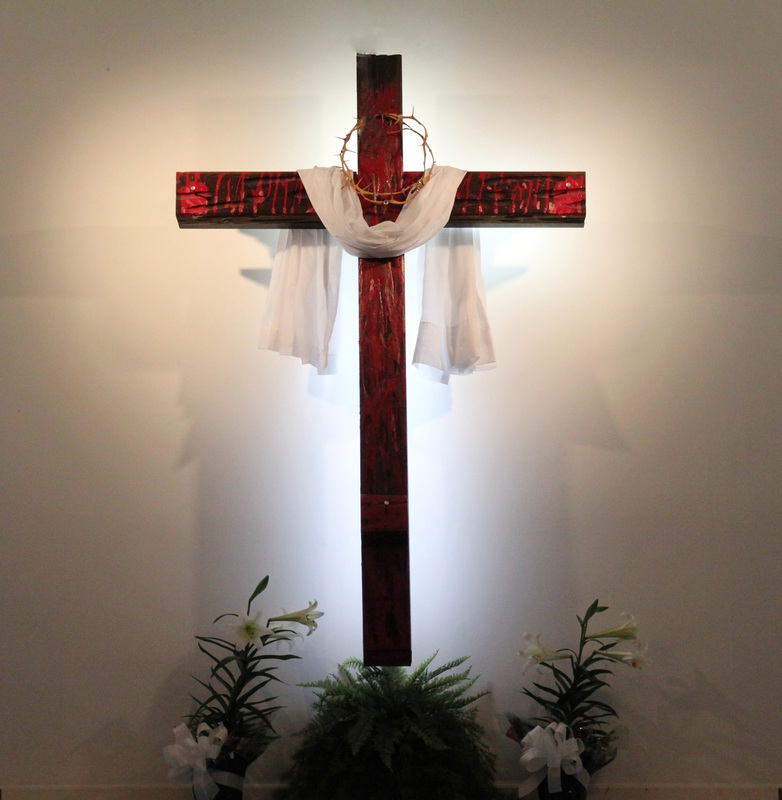 This entry was posted in Jesus, Resurrection Lutheran Church, service, vocation and tagged Acts 1, Good to Great, Jim Collins, Sarah Storvick on April 20, 2013 by Pastor John Keller. Yesterday was Youth Sunday at Resurrection and I was a very thankful pastor as I watched our youth sing, pray, read, welcome and preach. Here are my top five reasons for celebrating Youth Sunday. 1. The opportunity to celebrate talent. 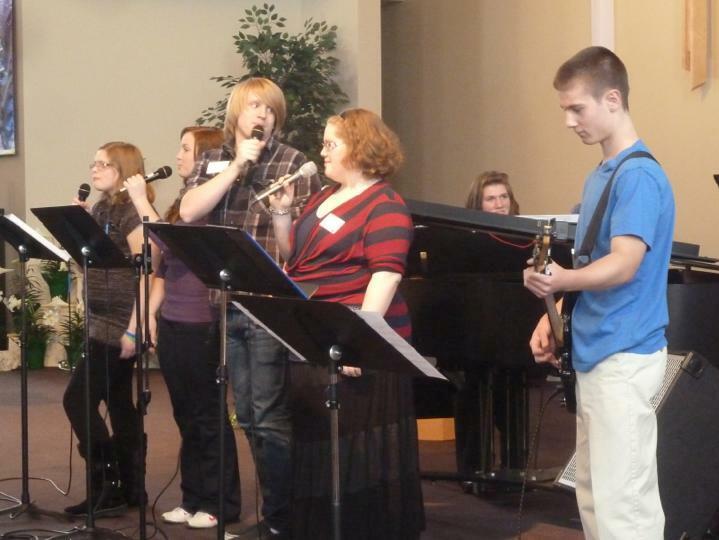 The youth of Resurrection are blessed by God with incredible talent that needs to be shared. Like any member, they could do this any Sunday, but Youth Sunday gives them the excuse or reason to do this with their peers’ support. The whole congregation, young and old, can celebrate together. 2. Parents can rejoice with their children. Parents of high school youth know that their children need to start the process of differentiation – separating from their parents. This includes making their Christian faith their own. But this can be painful for the parents to watch. The celebration of Youth Sunday gives parents a moment to see the faith being handed down to a new generation without directly pushing their children into it. 3. Young children are given aspirations and models. Young elementary age children see older siblings/peers/teenagers participate in a special way within the life of the church. This participation can spark such aspirations in them to perform in the worship band or read scripture or present the children’s message. Also parents of young children see and hear how the ministry of this congregation has impacted its youth, giving them reasons for their family to be actively involved. 4. Mentors share their gifts. 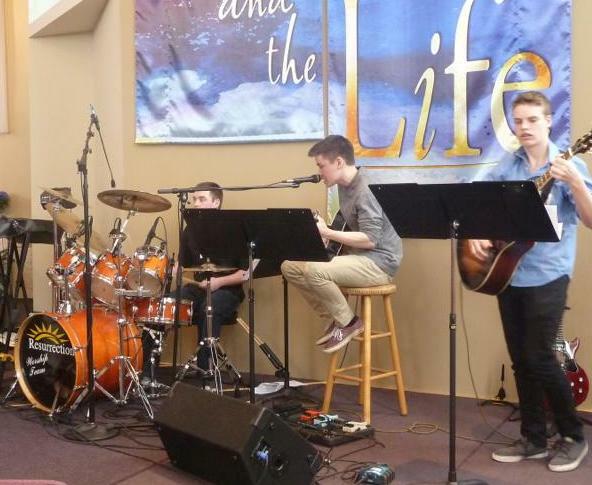 Yesterday was a real celebration for John Moore, a member of our worship team, who for the past six months has coached and directed the youth band as it prepared for yesterday’s worship service. He and the band did an outstanding job. Our youth director Hannah Koehler also had the opportunity to directly mentor students as they participated in leadership roles in worship. 5. Pastor try-outs. This one is personal for me. As high school junior I had the opportunity to preach at my home congregation. Though my preaching on the “Population Bomb and Environmentalism” was strange and controversial, the affirmations I received were part of my process of discerning my call as a pastor. Though our youth can serve God’s kingdom in a wide variety of vocations (see here), the church will need good pastors, youth directors and music directors in the future and I am praying that God will call some of the youth of Resurrection Lutheran Church to serve in this way. God continues to call forth his servants to serve among us. What are some others reasons to support Youth Sunday? Lord Jesus, I am thankful that you call all ages to follow you, including our youth. This entry was posted in Preaching, Resurrection Lutheran Church, vocation, worship and tagged Parent, pastor, Youth Sunday on April 15, 2013 by Pastor John Keller. 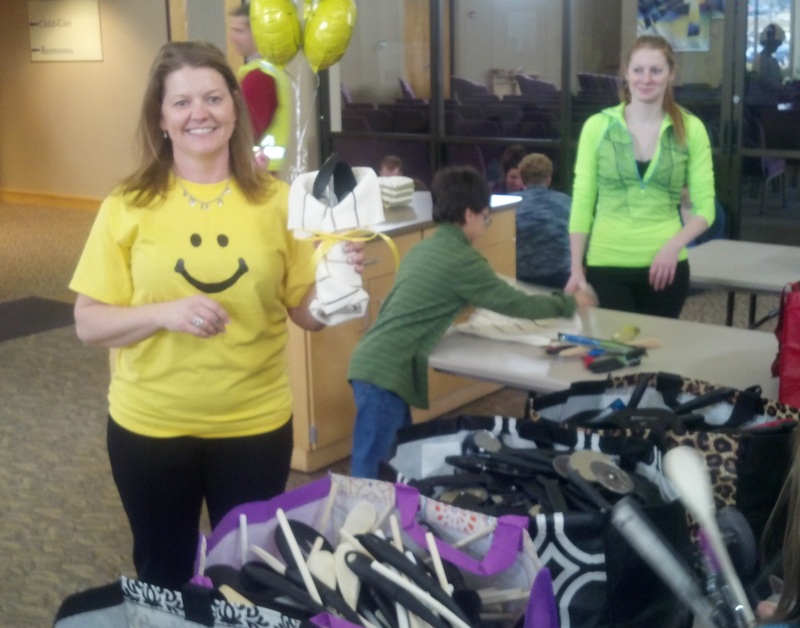 Yesterday was Resurrection Lutheran Church’s annual Faith In Action Day. 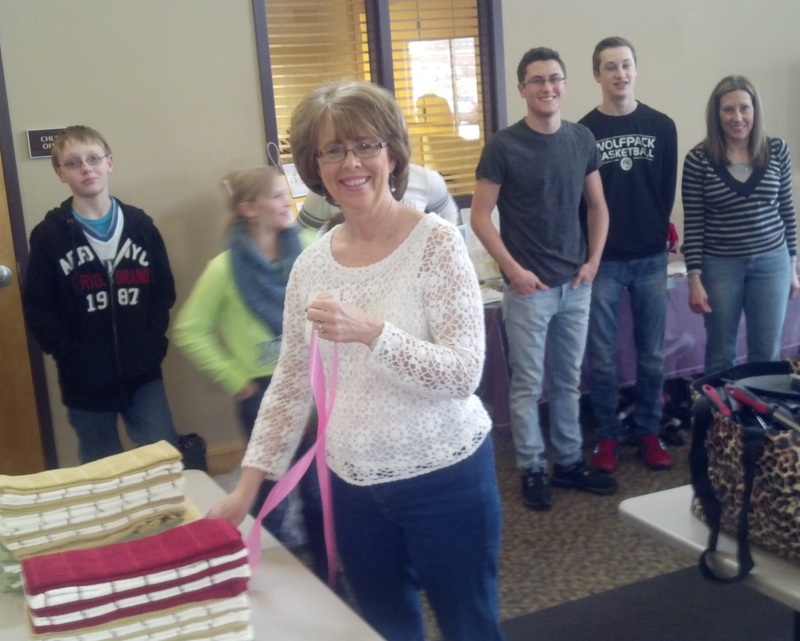 Over 200 volunteers worked on a wide variety of service projects. 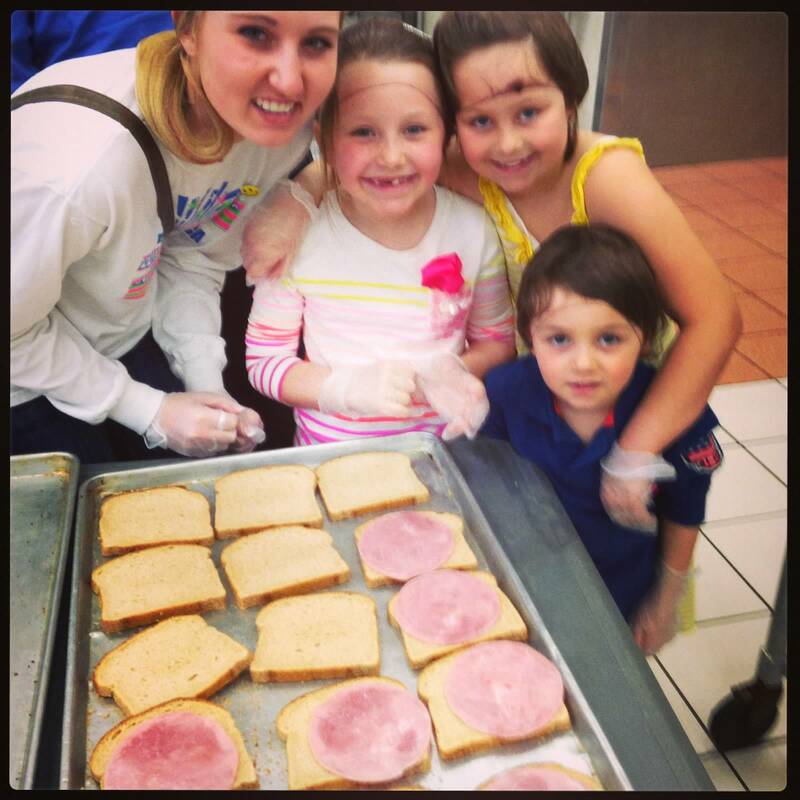 From making snack kits for children-in-need and kitchen packs for families in transitions to serving meals at local food shelters, we honored and celebrated one part of our mission statement: To Serve the world God loves. I wrote about my first experience with Faith In Action day here. It was a day that both encouraged and humbled me as a pastor. I was extremely proud to see children, youth, and adults using their gifts, talents and dependable strengths to help their neighbor. I felt like a cheerleader, supporting all the good works. I was also humbled because I realized that so much of the good that members do does not require a pastor, but rather the power of the Holy Spirit. I am so thankful for the team of lay members, led by Terri Dokken, who coordinated the fifteen projects we worked on. In my sermon, I talked about two kinds of good works. The first is the kind we experienced on Sunday, volunteer good works. As volunteers we do something directly to help our neighbor in need. We pack food at Feed our Starving Children or pound nails at Habitat for Humanity. These are valuable experiences where we learn about the needs of others and actually practice service in a tangible way. Plus it builds a sense of community and identity as old and new member work side-by-side. But there is the second kind of good work, the daily good work, where we love our neighbor in our daily activity. A mom or dad who taxis the children to their daily activities, a nurse or doctor who treats patients, a social worker who aids families in caring for an aging parent: all of these can be considered good work. Some good works become our vocation or career. Hopefully as Christians we see our career as a way to serve others, either directly or indirectly. I have written regarding daily work on other posts: here and here. Lord Jesus, help us to walk in the good works you have prepared for us. This entry was posted in Bible, Resurrection Lutheran Church, service, Uncategorized, vocation and tagged Ephesians 2:10, Faith in action, good works, Volunteering on April 8, 2013 by Pastor John Keller. This week starts a new ministry at Resurrection called Four Square, named after the popular playground game. The four squares of the ministry are explore, play, serve and grow. The children will explore the Bible, serve various needs in the community, play games like four square, and grow in their faith and relationship. 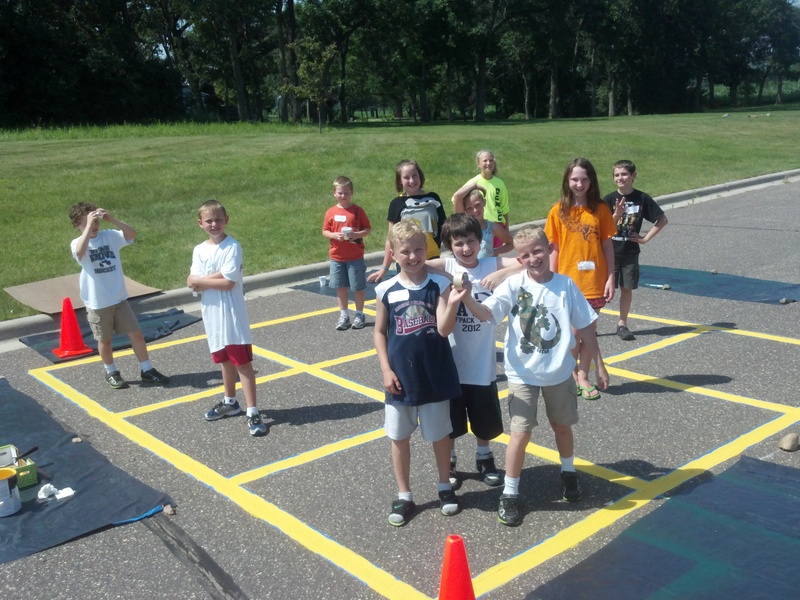 Today they actually painted a Nine-Square court in the church parking lot for all to use. The “play” part of Four Square made me think of a comment that I explored somewhat last year. The idea is that in our American culture we confuse worship, work and play. We worship our work, work at play and play at worship. I know that I can be guilt of each attribute at times. First we tend to worship our work. Especially men in our society can make their careers the center of their lives. Our whole identity can revolve around our careers and how successful we are within it. Careers often have a clear hierarchy of who is moving up the ladder and who is not. Though God calls us to work in God’s creation, God does not call us to place our career success at the center of our lives. I confess that I can place MY pastoral status ahead of my faithfulness to God’s mission and calling. “Seek first the Kingdom of God and his righteousness and all these things shall be yours as well” (Matthew 6:33). Second we can work at our play. In our American culture, we can turn our leisure into a new work obsession. Whether it is fishing, hunting, golf, running, tennis, gardening, woodworking or biking, we can turn what is meant to be restful and renewing into competitive, stressful work. I know that I have at times turned my love of running into an obsession when I am training for a marathon and my whole life begins to revolved around a rigorous training schedule. I have this elusive goal of qualifying to run in the Boston Marathon someday, but my fixation can rob me of the joy of simple running. My recent use of the Phil Maffetone training method has helped me slow down and to enjoy the playful act of running. Finally we can play at worship, or, in other words, turn worship into entertainment. We measure how effective worship is by how popular the worship service is or how people felt during the service. We get confused about the focus of worship. Worship is not about the worshippers, but about God being central to our lives. God is not my “cosmic therapist” who makes me feel good about myself, but rather my Creator, Savior and Guide before whom I bow in wonder and adoration. God is God, ruler of the universe. True worship helps me remember and live with God at the center. “God is spirit and those who worship him must worship him in spirit and in truth” (John 4:24). So today, let us live with God at the center, in our work, play and worship. Lord Jesus, remain Lord of my life in my work, play and worship. This entry was posted in Body Mind Spirit, Jesus, Resurrection Lutheran Church, Running, Uncategorized, vocation, worship and tagged Four Square, play, work on June 27, 2012 by Pastor John Keller.